This is one of my Mom's signature recipe n my favorite too :) This is a very flavorful n tasty kuzhambu which goes well with rice, chapathi, idly/dosa. First Grind coconut, dalia,poppy seeds,1tsp fennel seeds and keep aside. Heat oil in a pressure cooker ,add mustard seeds ..allow to splutter then add fennel seeds,clove,cinnamon and bay leaf and saute for few seconds. Then add ginger-garlic paste and fry till raw smell goes. 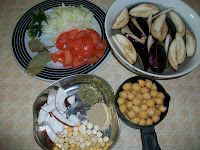 Fry the brinjal nicely and then add channa and throw in all dry powders mix well. Now add coconut paste and saute for few minutes and add enough water to your desired consistency. Add some chopped coriander leaves and few mint leaves(optional). Close the cooker and cook for 1 or 2 whistles.Wait till the pressure cools down and open the cooker, now ur masal kulambhu is ready . Instead of brinjal u can use potato n make this masal kuzhambu, potato n channa masal kuzhambu goes well with puri, parotta, idly/dosa n rotis also. Adding curry powder is optional but gives nice aroma n taste. Instead of making this in cooker, u can cook in wok with pre cooked channa with the same recipe. that's a pretty good curry, very innovative adding the brinjals. I can just imagine how yummy it must taste. Sanghi, whatever I want is in your blog and my taste buds are fully satisfied. However strangely one thing is lacking. I hope you will make attempt soon to rectify it. I searched for fish kuzhambu in other blogs but however I find it wanting not because of their expertise but because my manner of preparation is at fault. Please give your version. It somehow parallels the way my mom and mom-in-law prepare. Give your grandma's version of sambar powder too. You have posted all the other podis. Thank you and reply soon. My appreciation at your learning south indian cooking so well. First, my heart felt thanks to you for your appreciation. I am so glad that my recipes suits to your family' taste. Sure, I will share Sambar Powder recipe. I don't eat fish only kids and my husband i rarely make fish fry. They don't like fish in gravy or kuzhambu. But, i will share my grandma's fish kuzhambu recipe via email. Please send email to sangeethaskitchen@gmail.com Hope you understand. Thanks again for your love and support ! Hi, Thanks for this wonderful recipe. I tried it today, it tastes wonderful and my son liked it so much. Keep up the good work.